It is a real pleasure for me to join you at this lunch. I have learned D Group is a leading business networking entity. It is active in 23 locations around the world. Over the past 20 years members of the D Group have evolved an influential global business development network. Many of them are associated with China. D Group is clearly global in its thinking. But it is headquartered in London and I am Chinese Ambassador in the UK. So, I am delighted to respond to the theme proposed by Mr. Craine: how to build closer economic ties between China and Britain. I believe this topic has two implications. · Last year our bilateral trade neared 60 billion US dollars. · China was UK’s third largest trading partner only after the European Union and the United States. · UK’s direct investment in China amounted to more than 10 billion British pounds. This made Britain the second biggest investor in China among EU members. · Moreover, Britain has become one of the fastest growing markets for China’s outbound investments. · British exports to China last year had a value of 14.6 billion US dollars. But it only accounted for 3.1% of Britain’s total exports. · That 3.1% was even less than Britain’s exports to Ireland. · This Sino-UK export share is far too modest! · The reason is very simple. China is the world’s second largest importer and Britain the fourth largest trading nation. · The market shares of the top ten British export products in China are way below the market shares of Germany in China. 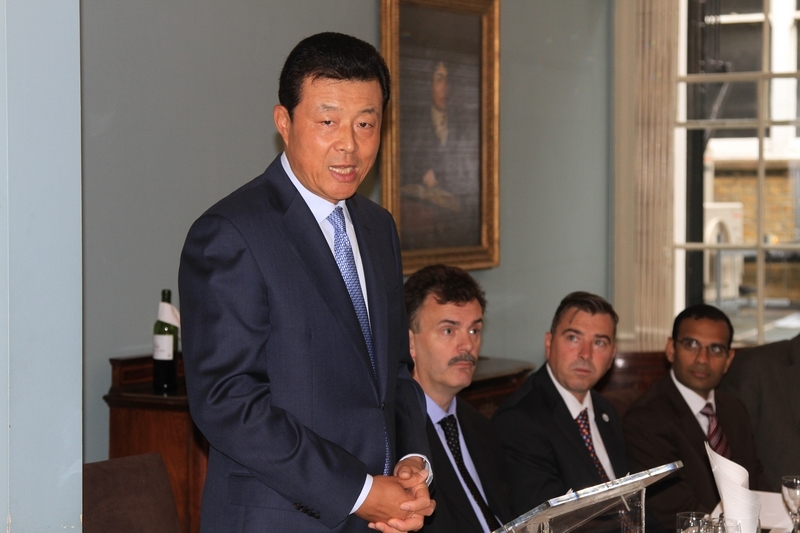 · Chinese investment in Britain is growing rapidly, yet it is still in the initial stage. 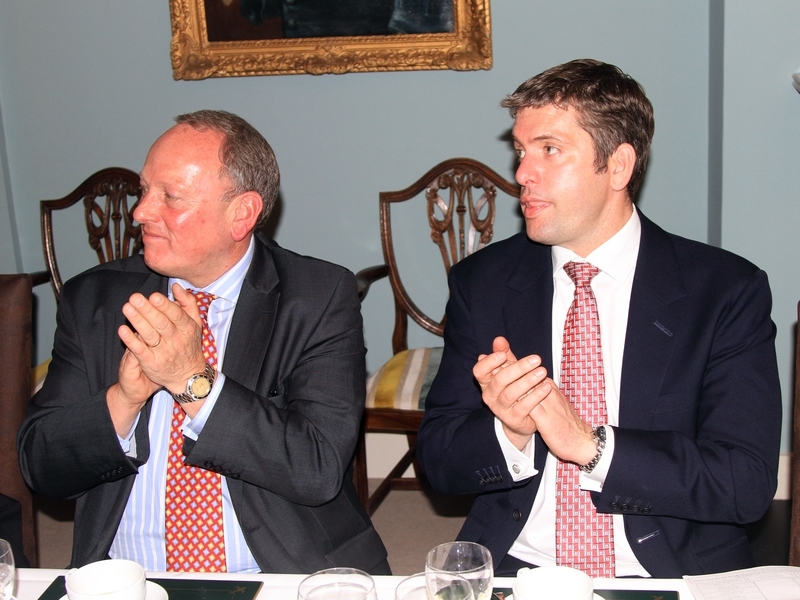 · The result is that great potential in China-UK economic cooperation remains untapped. Then how can we develop closer economic cooperation between our two countries? My answer may surprise you! I believe we should draw inspirations from the wisdom of Confucius. Confucius is the Chinese philosopher who is best known to the Western world. In very simple terms, the philosophy of Confucianism is about conducting oneself in society. Confucius was not a businessman. But, his philosophy has proved also applicable to statecraft and business management. For instance, one disciple of Confucius became the most successful businessman in China. Many modern Asian business leaders have benefited a lot from Confucianism in their careers. I want to use three quotations from Confucianist classics to explain to you my thoughts on expanding China-UK economic cooperation. At present, China-UK economic cooperation is blessed with both opportune time and favourable geographical position. Over the past four decades, since the inception of full diplomatic relations, our bilateral ties have come to new starting point. Deepening economic cooperation between China and Britain is an overriding trend. It is a logical choice at a right time. In terms of geographical position, Britain is reputed as a global hub of finance, information, logistics, creativity and innovation. In addition the UK boasts an open and free environment for business and investment. Little surprise then that Chinese companies consider Britain an important base for reaching out to the European continent and the world. What we should do is to maximize these advantages, and this is where a harmonious relationship can make a huge difference. A harmonious relationship between two countries is composed of, among others, a sound political relationship and an enabling public opinion. · and an improved overall environment. However, further growth of China-UK economic cooperation is not without resistance. Some negative noises are continuously being heard. For example, British media often kick up a fuss about the so-called “military background” of a Chinese company Huawei. The only reason is the president of this company is a veteran. This shows that some people’s minds are still trapped in ‘cold-war’ mentality. They are bent on creating all kinds of theories of “China threat”. Some of them have a myopic or blind view of China. Such closed mind-sets and biased opinion are nothing but harmful. I hope you business leaders present here will see China-UK win-win cooperation in an objective and reasonable light. I hope you will actively communicate your message to British public and media and foster a harmonious relationship. Expanding and deepening China-UK economic cooperation is not an easy task. It can be a long job. We need to identify targets and priorities and plan carefully. For example, our two governments sponsored a conference last year on infrastructure investment. A working group was set up at the conference to prioritize our cooperation in infrastructure. · Early this year China Investment Corporation purchased some shares of Thames Water. This purchase alone already passed the total Chinese investment in Britain last year. · Sinopec (China Petrochemical Corporation) acquired 49 percent of the Canadian based Talisman Energy’s assets in the UK. · Last week the Canadian court approved China National Offshore Corporation’s takeover of Nexen oil company. The production in North Sea account for half of its total output. · Also last week, China’s Huawei announced its investment and procurement package of 1.3 billion pounds in the UK. This package will in the coming five years create at least 700 local jobs. 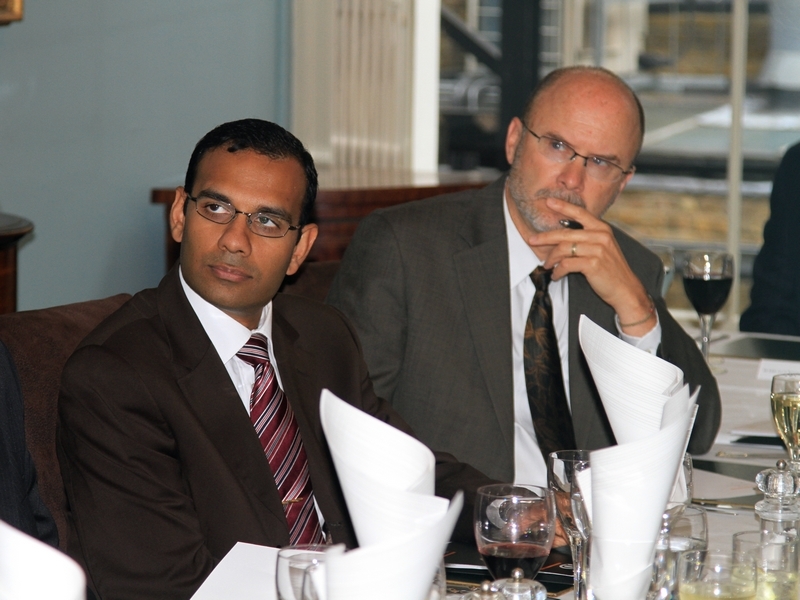 · There is also significant progress in other business sectors. · For example, China’s Bright Food bought 60% of Weetabix shares. This is the largest ever single overseas investment by China’s food industry. · So this is a year of rapid advance of Chinese investment in the UK. Chinese and British economies have a great deal to offer each other. I have no doubt that there are more win-win cooperation areas like infrastructure. Both sides should tap into the potential, strengthen planning and work together for more success stories. · China is the world’s second largest market. 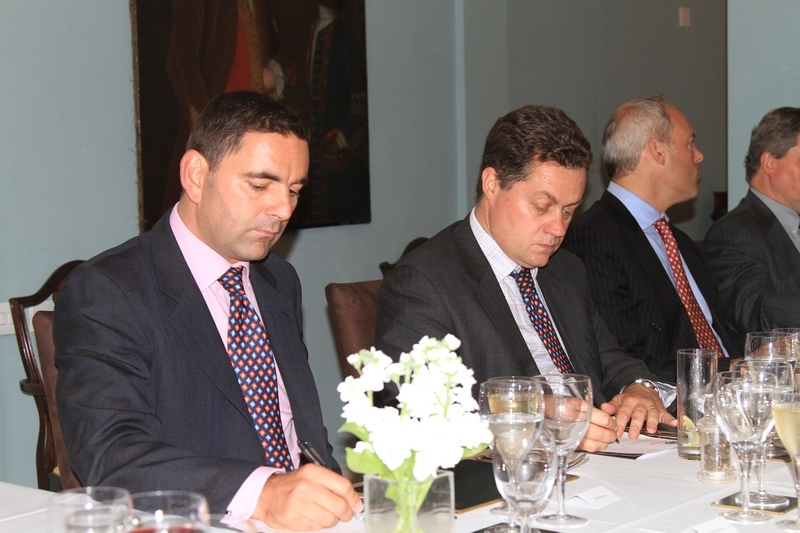 · There is a clear road map for British business to follow in China’s 12th five-year plan. It provides excellent strategic indicators. · The latest plan covers the five years from 2011 to 2015. · The plan estimates China’s imports will reach eight to ten trillion US dollars. · China is also the fastest growing source of outbound investment. · The plan indicates that outbound investment will top 500 billion US dollars. · The number of Chinese outbound tourists is growing fast. · Last year China contributed 7.2% to global tourism markets. · Records show that during the London Olympics average spending of Chinese tourists was 10% higher than that of those from UAE. 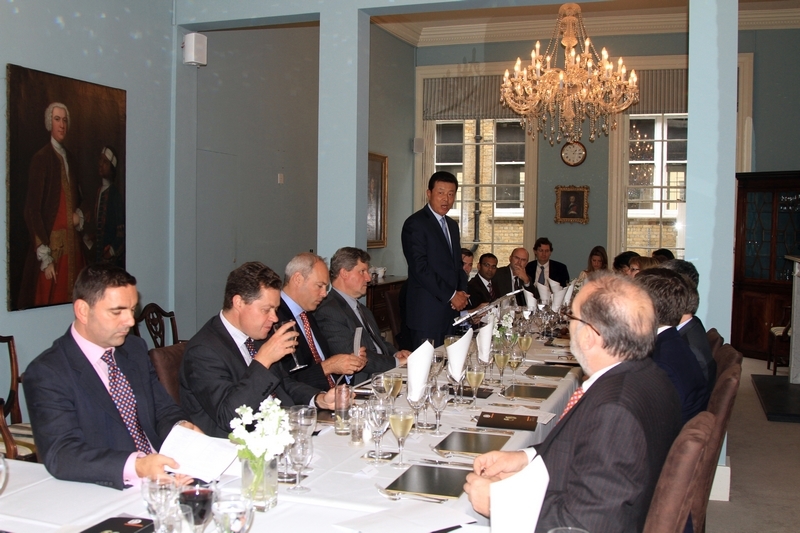 · In summary, British businesses must seize such enormous opportunities linked to the Chinese market. However, my observation shows that the British Government agencies give the impression of a somewhat ‘love-hate’ feeling towards China. On the positive side, the UK wants to expand cooperation with China. Then there are negative messages expressed through worries and concerns. The result is that the policies of different government departments sometimes conflict with each other. Some are even self-defeating. Here are some examples. The Department for Business, Innovation and Skills is working hard to attract more Chinese investors. The cultural and tourist authorities stress the aim that Britain will receive as many tourists and consumers from China as from France. Currently France attracts eight times more Chinese tourists than that of the UK. But the policy of some UK government offices gives a very different signal; their message is to strictly prevent ‘illegal immigrants’. In turn, the UK Borders Agency enforces very complicated and time-consuming rules for visa applications. Little wonder that the British Ambassador in China was recently quoted in the British media on this issue; he indicated that the UK runs the risk of creating an image in China of “Fortress Britain”. · The rules ask Chinese applicants to fill a dozen pages, declare individual and family privacies and provide proof of income. · Applicants also have to leave their fingerprints at the designated visa centers that only exist in very few big Chinese cities. · I have heard a lot of complaints from Chinese businessmen and tourists about such obviously unreasonable treatment. · I have no idea whether British citizens will have to go through the same if they are traveling abroad. · Certainly in the case of China the process is simple and fast for UK tourists applying for a visa. It takes a matter of minutes to fill out a simple two page form. · In summary, I would suggest that the British government weigh and balance the opportunity costs and make the right choice. Likewise, I feel some British businesses also reveal misgivings about cooperation with China and seem to be rather conservative. Overall, I sense that this is due to lack of knowledge of the reality of China today. China is transforming its economic growth pattern. It needs to import some technologies for industrial upgrading. Britain ranks the second in the world in terms of a technology reservoir. Yet when it comes to high tech export to China from EU members, the UK comes after Germany, France, Italy and Sweden. Let me describe examples of the potential of some technologies where Britain is really strong. This is in the area of ‘new energy’ technology. The UK has great strengths in renewable energy, low carbon developments and the environmental sectors. These do not have a big role to play in Britain due to the small market size and the current industrial mix. Or you could say their value can hardly be maximized. But, once introduced to China, these ‘new energy’ technologies will generate huge economic and social returns. Friends from the British business sector. Sound development of China-UK economic ties cannot be isolated from the overall global economic landscape. There are particular close links related to the trajectory of the European economy. Recently, Chinese Premier Wen Jiabao attended the 15th China-EU Summit in Brussels. The two sides reached broad agreement in the economic field and achieved important outcomes. · China wants to promote growth of both Chinese and European economies. I am convinced that the more stable the European economy, the better China-EU economic ties. Steady growth of China-EU economic relations will provide a favorable environment and strong driving force for China-UK economic cooperation. Today I have made three quotations from Confucianist thoughts. My aim was to help express my views on the achievements, problems and future direction of China-UK economic cooperation. I have no doubt that as long as both China and the UK seize the opportunities, take bold action and rise up to challenges, our economic cooperation will have a bright future.